We are approaching the less than 2 months mark for the start of Piggy's Revenge 2017. Sign up now so you will be guaranteed to get a T-Shirt in your size. After December 20th no more tshirts orders will be taken. The weather has been cooperative this year with the last few months of dry and windy days to dry up all the trails. Last year was exceptionally wet, the conditions this year will be to the opposite. We are expecting a completely dry event. We have over 100 miles of roads and trails to choose from. We have been riding all over the 50 square miles of conservation land available to us in order to select the best places to ride on. Several trails still need to be mowed at this time but we are working on getting them cleared. Attached are some picture from one of our rides where we encountered tall grass, shandy trails, many deer and a few lazy alligators. The Pigs help us work the trails as we get to follow the piggy highways. They follow the same trails daily and the hooves hammer the ground giving riders a hard path to follow through the grass. This years event will be different from last years event with some new single tracks for the 40 milers and the 60 mile course will be marked, so no GPS needed. We wont leave the Carlton Preserve and will cover a mix of gravel roads, grass trails, dirt double track, and very very little asphalt. Fat point will be serving up some frosty beverages, the "Tom Oasis " sag stop will be again the highlight for most riders and don't forget the fresh homemade Bratwurst hot off the grill at the finish. All the profits from the funds raised by the event are spent on creating new trails and maintaining the existing ones. In the last 5 years SCORR has built and maintained over 17 miles of single track in three properties and we have several new sections in the planning phase. 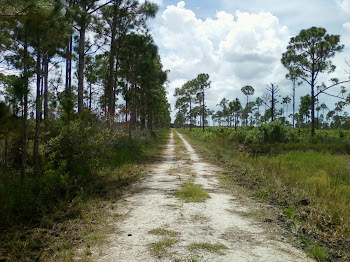 Your support will help SCORR invest in our trail system and make south Sarasota County a great area for off-road riding.